The Madison-Rafah Sister City Project owns the following films and can lend them for free public showings or household viewing. We can also provide someone to introduce the film and facilitate discussion. See SPEAKERS and LENDING POLICIES below for more details. 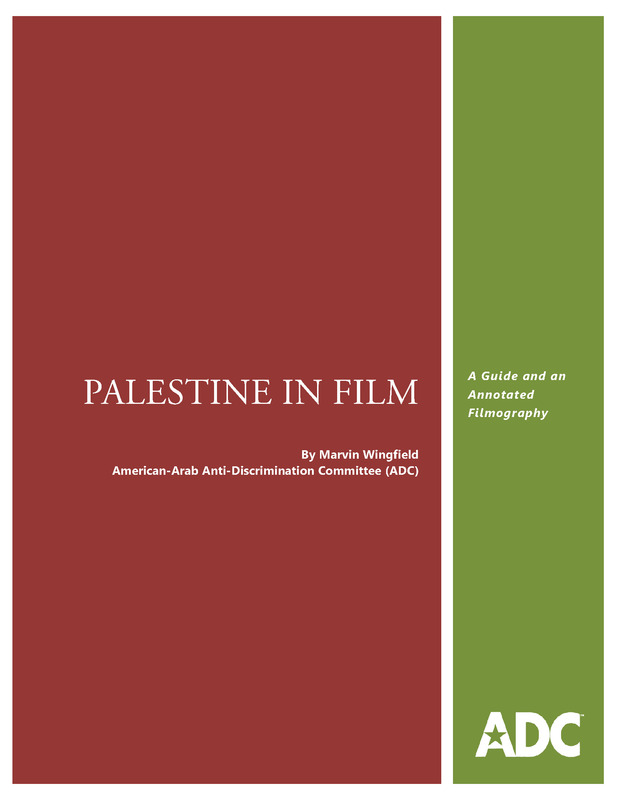 To commemorate the anniversary of the Palestinian Nakba, the American-Arab Anti-Discrimination Committee (ADC) announced the online publication of a guide to Palestinian film and filmmaking. It features information on and access to hundreds of films and film institutions, giving an unprecedented overview of almost every aspect of Palestinian filmmaking. Jenny Morgan, 2002. VHS. 52 min. History Undercover (TV), 2001. Locally taped VHS. 50 min. During the Six Day War in 1967 the USS Liberty was attacked in international waters by Israeli forces. 34 Americans were killed. Yet the U.S. government helped to cover up the incident from the American public. A thorough examination of the incident and the reasons behind it. Iara Lee, 2011. HDCAM or DVD. 73 minutes. Sandra Jordan and Rodrigo Vasquez, 2003. VHS. 52 min. Documentary by two British journalists who travel to the Gaza Strip and immediately experience Israeli gunfire and teargas as they cover a memorial service for Rachel Corrie. Staying five weeks, they document the Corrie killing, the fatal shooting of Tom Hurndall and that of British cameraman James Miller, as well as the deaths and injuries of scores of Palestinians. January 2009. DVD. 48 min. This film aired on UK Channel 4 right at the end of the January 2009 Israeli attack on Gaza. It focuses on news — especially TV — coverage of the Israeli assault. It details how Israel kept all journalists at least a mile away, preventing any reporting by Western news personnel actually on the ground inside Gaza. It shows that this media containment and control operation was planned and prepared for several months before the attack (the same period when the military operation was planned). The Israeli government felt they had failed to sufficiently control the media during the 2006 “war” on Lebanon, and this time sought to establish complete control. Except for Aljazeera and Press TV, they succeeded brilliantly. Besides being completely kept out of Gaza, the media people were deluged as they arrived in Israel with already-prepared “briefings,” with stacks of already-printed “background information” publications, and with organized visits to see the “devastation” resulting from Palestinian rockets in border towns. The media control campaign took advantage of Western journalistic professional norms that emphasize the necessity of reporters seeing first hand; thus, the reporters with jobs with the Western media tended to discount the information and footage that came out through the brave stringers most of the organizations had in the Gaza strip (“we cannot independently confirm these reports”). Their own training and professional values thus worked in favor of the blackout desired by Israel. The film is shot through with the horrifying and gruesome footage that you saw if you watched Aljazeera — what the Western media would have seen inside Gaza had they been there. For many, seeing this material will be a shocking first. The film does give the British media executives plenty of time to justify their policies. The narrator, John Snow, is meticulously “neutral” and so does not often call a lie a lie, but leaves the viewer to find the implication. James Longley, 2002. VHS and DVD. 74 min. Free Speech TV, 2002. VHS. 91 min. Covers a Global Exchange peace-making “reality tour” to Israel and Palestine. A slice of life seen through the eyes of Americans traveling for 8 days on a political tour through the region. Mohammed Alatar, 2006. DVD. 58 min. One of the best new (2006) films; fine maps, historical summaries. This thorough documentary gives an excellent historical background, as well as conveying an understanding of the scope and intentions of Israel’s huge separation wall project, together with the effects on Palestinians. BBC documentary, 2003. VHS. 60 min. Made while U.S. and U.K. accused Iraq of creating nuclear weapons. Meanwhile, Israeli whistleblower Mordechai Vanunu had been in prison 17 years for exposing Israel’s nuclear bomb factory to the world. Tells the story of the Israeli bomb, Vanunu, and Israel’s continuing wall of silence. Mohammed Bakri, 2002. VHS. 54 min. Sufyan and Abdallah Omeish, 2007. DVD. 90 min. James Dajani and David Michaelis, 2006. Locally-taped VHS. 60 min. John Pilger, 2004. DVD. 53 min. Bathsheba Ratzkoff and Sut Jhally, 2004. DVD or VHS. 80 min. Hana Abu-Assad, 2002. DVD. 86 min. Dennis Mueler, 2001. VHS. 71 min. Until When . . .
Dahna Abourahme, 2004. DVD. 76 min. Testimonies of soldiers about their service in Hebron, where the lives of over 100,000 Palestinians are subject to the control of Israeli Defense Force troops protecting a few hundred fanatical Jewish settlers. Film made by the organization of discharged Israeli soldiers who have decided to break the silence imposed by the IDF on their experiences as enforcers of the occupation. S. Smith Patrick, 2002. VHS. 29 min. Documentary about “creating something out of nothing” with a children’s dance troupe in Dheisheh Refugee Camp in Bethlehem. Shows life in the Camp, and includes a visit by the children to their grandparents’ villages in present-day Israel. Andrew Courtney and Emily Perry, 2004. DVD. 43 min. (28 min. version also included). Two American activist filmmakers explore the impact on the wall on the lives of seven ordinary Palestinians. Several perspectives on the wall and on Israel’s objectives are included. Frank Barat, 2008. Online and downloaded DVD. 26 min. A number of members and supporters who have traveled to different parts of Palestine and the Middle East are available to speak. Talks with slide or film showings are available. We can help arrange other speakers and participants for panel discussions, some nationally and internationally known, with sufficient notice. Contact us under Films and Speakers in Contacts. Michele and Tsela participated in a Madison-Rafah delegation in 2012. Michele has also visited Palestine and Israel with the Interfaith Peace-Builders and the US Campaign to End the Occupation in August of 2008. Michele met with representatives of Israeli and Palestinian civil society, religious leaders, politicians, businesspeople, farmers, students, human rights workers and former combatants. Michele has been concerned about the grave human rights violations that the Palestinians face in the occupied territories and in Israel on a daily basis. Michele was able to see these violations first hand and is interested in sharing what she learned. Many of the Palestinians that Michele met with said they want people in her community to hear their stories because they know they are rarely told in the United States. These members of Madison delegations to Rafah have visited areas including Rafah, the Gaza Strip, Jerusalem, and the West Bank. They have observed and experienced first hand not only the obstacles to every aspect of Palestinian life – the uncertain wait at checkpoints on the way to work or school or to see family, whether you will be allowed to pass at all, the wait for permits required by Israel for travel of just a few miles, or permission to go to a hospital or medical center for treatment – but also the determination and dignity of Palestinians in the face of these impossible conditions. Slideshows are available to accompany their talks. Our films cannot be used for showings where an admission fee is charged. Some of the films are not licensed for even free public showings. Certain films are VHS format videotapes, as noted. Borrowers take responsibility for returning the films in good condition and for any shipping and postage costs. To discuss a film and a showing, contact us under Films and Speakers in Contacts. The Madison Rafah Sister City Project was founded in February 2003 and involves a group of concerned citizens in Madison, Wisconsin and the town and refugee camp of Rafah in the Gaza Strip, Palestine working together to forge person-to-person understanding between our two communities. We focus our efforts on humanitarian aid and community education, and expect to build wider public awareness of the Israeli-Palestinian conflict and a lasting relationship that will positively affect the citizens of both cities. For more information, see Contacts.